We did it! Trinity ONE is now shipping! | Trinity Coffee Co.
We got there! 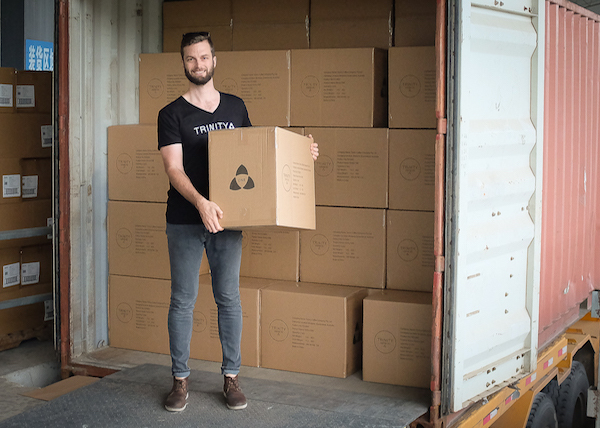 It has taken an indescribable amount of effort over the last 3 years since I dreamed of the Trinity ONE, but we have finally commenced shipments! We are already about halfway through the production order, and are continuing through assembly and packing until all orders are shipped from our factory. We have not stopped since we loaded our first container (above) and are working 7 days a week until we get them all done. Thanks for making this dream happen! This is truly unique product, and it has been developed 100% by the backing of it's customers. Each of you has played a highly important part, and through your patience and support the dream has become a reality to create the world's first all-in-one manual brewing appliance for specialty coffee. Simply, there is nothing else like Trinity ONE anywhere in the world!